GH CRANES & COMPONENTS Automotive gantry crane on tires 40t. GH CRANES & COMPONENTS Automotive gantry crane on tires GH-60i. 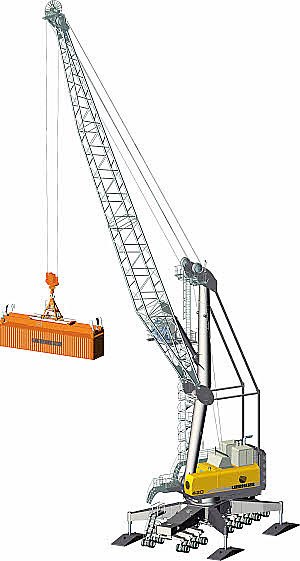 A rubber-tired crane can lift and move loads from place to place. It is mounted on a self-propelled vehicle with a steering system. Such cranes are used for moving bulk cargo, harbor construction and shipyard work and for other port operations. The crane base holds a rotating platform and the vehicle's propulsion system. The operator's cabin has both crane and vehicular controls. It can be situated on the base or elevated above it. The boom is mounted on the platform and uses cables, slings and hooks to handle loads. There are usually hydraulic legs attached to the base for stability during lifting operations. Choice will depend primarily on lift capacity, the size and weight of the loads to be handled and the nature of the terrain where the crane will operate.